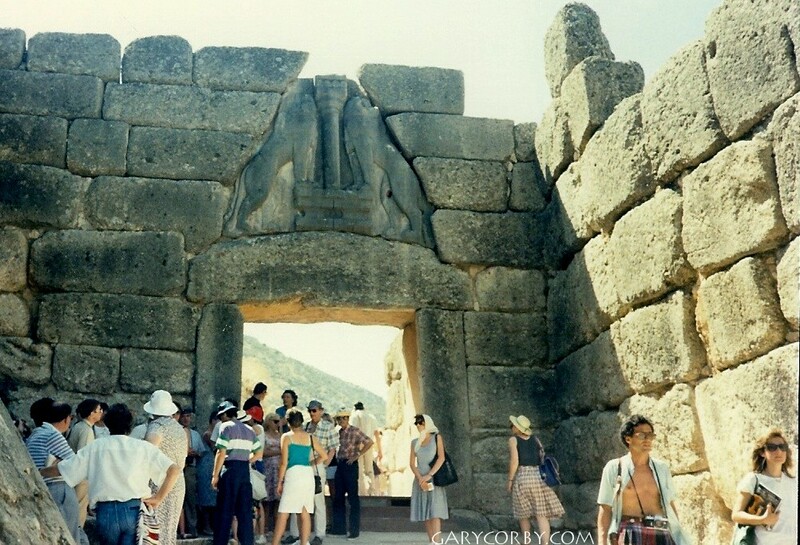 The Greeks had no concept of an arch as we know it. The Greek temple design is incredibly elegant, and one of the most copied building designs to this day, but it amounts to piling one thing directly on top of another. This is the famous Lion Gate at Mycenae. I took this picture myself, many years ago. The stones above the lintel have been placed to overlap a bit, one above another, so that you get the illusion of an arch in negative. The stones would stay there even if the relief of two lions didn't fill the gap. By classical times, even the corbel arch had pretty much disappeared from Greek designs. As you can see, the whole thing would collapse in an instant if gravity wasn't pulling down on every block. Or in this case, on every computer monitor. It relies on shaping every block exactly for its position. The topmost block (monitor) is hugely important and is called the keystone. It's really very clever. The downside is nothing can stay up until everything's in place. So they'd build wooden supports beneath and then knock them away after the keystone was in. The one thing both Greek and Roman architecture have in common is they both use gravity as glue. Gravity as glue. . .
And they say physics can't be poetic. A little alliteration can take you a long way. Hi Sarah! I should point out I'm not responsible for the monitors. That picture's doing the rounds of the net and I linked to the source. Greek and Roman buildings are stable-by-design, which is why they've lasted so long. Also of course things like the pyramids. If you jiggle them, because gravity's their glue, the bits settle back to where they were. Large modern buildings are not inherently stable and therefore won't last nearly as long. The Arch in St. Louis, MO (Gateway to the west maybe?) is of the same design and construction -- a perfect parabola, as tall as it is wide. It's really quite impressive to see, and if you go up to the top, you can feel the whole thing swaying in the wind, which is slightly disconcerting. There are pictures of the keystone being placed during its construction in their little museum thing. 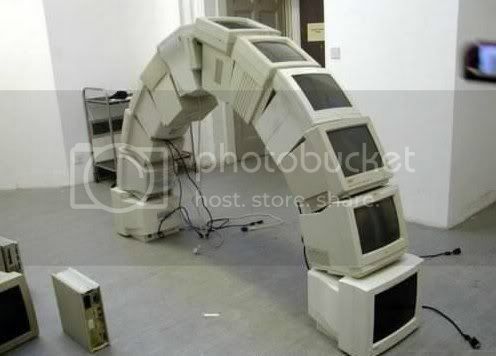 Not as cool as a computer monitor arch though, for sure. Now that's pretty damn cool! I love the computer monitor picture. Instant "how did they do that??" I imagine about eight people each struggling to hold a giant CRT monitor in its place in the arch, sweating profusely and trembling until finally, finally, the last one is gently settled into place. It's an amusing mental image. "The whole thing would collapse in an instant if gravity wasn't pulling down on every block." Oh, come now. If gravity wasn't pulling down on every block, it wouldn't be able to collapse! A fair point. Clearly I should avoid civil engineering as a career.